Author: Geisler, Norman, Holden, Joseph M.
In the Preface the reader is told, “The content of this book is not meant to be an exhaustive treatment of manuscripts or archaeological findings” (p. 17). However, by the time the reader is into Part One, he is more than knee deep in the history of the findings, their significance to the authority of the Bible, and a very good explanation of the various manuscripts which have been found and used to form the Bible most of us have today. The thorough connection the authors make between the Old Testament Manuscripts that have been found and the biblical portions they reveal is enough to convince. However, Holden and Geisler clearly state that to assume that any extrabiblical discovery or literature determines or “proves” the Bible is to make the greatest error. 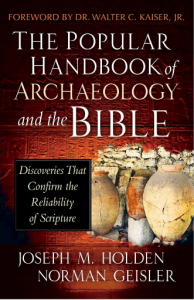 The authors clearly agree that one must believe in the inerrant Scripture first, then appreciate how many archaeological and literary discoveries support its authenticity. I caution the lay reader that this book is not one to lay out pictures of rocks on a page, or make great lists of each of the Dead Sea Scrolls, or stone engravings (called Steles), but there is considerable text which is highly enlightening. I enjoyed the section on the various maps in Part Five. A Greek mosaic floor map depicting Jerusalem and Damascus compares accurately to the Holy Land we find in the Bible. In chapter 18 there is a complete run down of the discoveries related to the Amarna Letters which confirms the ancient biblical city of Megiddo and tells much of the same events we have in I Kings concerning Solomon, the Temple, Kings Darius, Xerxes, and Artaxerxes. I especially enjoyed Chapter 22’s extensive information of literary confirmations other than the popular Dead Sea Scroll references. We have all read Josephus, but in this chapter, the authors tie the writings of the Babylonian Talmud, the words of Tacitus, of Gaius, of Pliny, of Lucian, and even Erastus to Scripture. I learned much about the Temple Mount in chapter 24. This chapter connects each of the Temples built, their destruction and rebuilding to various archaeological finds and separates each for easier reading. As with many books, I often buy just for the extensive bibliography. You will not be disappointed in this book or its references.